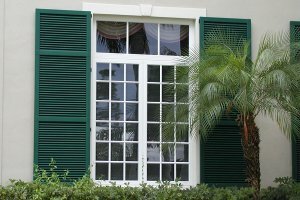 Colonial Louvered shutters feature an easy to operate, open louver* Storm Shutter system that captures the charm and sophistication of traditional wooden louvers. The colonial shutter is hinged at the sides and opens to the left and right of the window or door opening. It is held open by friction catches, shutter dogs or hook and eye hardware. When closed, it is secured in position by means of a horizontal “storm bar” secured to the shutter by machine screw and machine screw anchor. 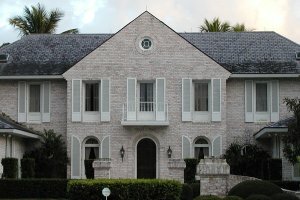 The traditional style of the colonial shutter has genuine practical and aesthetic qualities that are essential to island style living, Colonial, Mediterranean and Caribbean architecture. 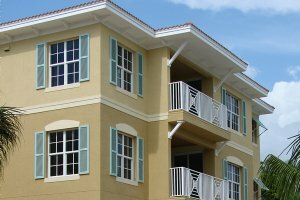 More than being highly decorative, adding charm and character to the architecture, these products offer proven storm protection and impact tested performance. Naturally ventilated, they work well over open windows and door way areas that need sun and rain protection without loss of airflow. Being versatile in construction and function, this shutter product is adaptable for use on most residential, institutional and professional buildings. * Open louver refers to a ventilated panel composed of individual louvers used in series. This is in contrast to solid-backed or false louver systems that only give the appearance of an open style louver. In addition to the standard colonial louvered shutter, board & batten style, solid-backed, and fixed decorative panels are available upon request.